This temple is the head temple of the Tofukuji School of the Rinzai sect of Zen Buddhism. It was built in 1236 on the instructions of Kujo Michiie, the great statesman of the Kamakura period, who desired to build in Kyoto a temple complexes in Nara. It covers an area of 200,000 square meters. The temple's name "Tofuku-ji" is a combination of one character from the names of each of ara's temples Todai-ji and Kofuku-ji. Tofuku-ji is one of the so-called Kyoto Gozan or "five great Zen temples of Kyoto", along with the Tenryu-ji, Shokoku-ji, Kennin-ji, and Manju-ji, with Nanzen-ji presiding as the head temple. Tofuku-ji was destroyed by fires in 1319, 1334 and 1336. Although its original buildings were burned, they were rebuilt in the 15th century according to the original plans. Other buildings within the temple complex were reconstructed more recently, like the Abbot's Hall (Hojo) in 1890. Its many compounds and sub-temples survived the ravages of war and fire until the late Meiji period when the Butsuden (Buddha hall) were burned. 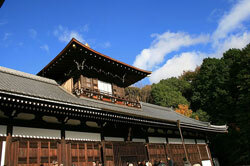 However, it even now retains the magnificent scale characteristic of a medieval Zen temple. The Sanmon gate, a National Treaure, is the oldest Zen main gate in Japan. The Zendo (meditation hall), Tosu (lavatory) and Yokushitsu (bathing room) are also survivals from the early Muromachi period (14th century). The Hondo (main hall) and the Hojo (hear priest's quarters) are recent reconstructions. The valley up to the Kaisando, spanned by its three bridges, is famous for its maple leaves in autumn. The colossal 22m high San-mon Gate is the largest Zen temple gate in Japan. It was built in 1425 and entirely disassembled, repaired and reconstructed from 1969 to 1978 at the cost of US 2.5 million dollars. Walking around the complex of Tofuku-ji is free, although the beautiful zen gardens and Tsuten-kyo "Bridge to Heaven") require an entrance fee. The bridge is especially nice in autumn when the momiji maples leaves turn red and yellow. Note that two other nearby bridges can be crossed for free. The first one is where most visitors come from, but the entrance to the second is hidden behind the Abbot's Hall. Each autumn, Tofukuji becomes one of Japan's most spectacular (and crowded) spots for autumn leaf viewing. The second half of November is usually the best time to view the ocean of colored trees in combination with the traditional temple architecture. 15-778 Honmachi, Higashiyama-ku, Kyoto-shi, Kyoto. Bus 208 from Kyoto station stops at Tofukuji-mae. From there it is a five-minute walk to reach San-mon Gate and the Abbot's Hall. Try to follow other tourists as it is easy to get lost in the small alleys among minor temples of the Tofukuji complex. Tofuku-ji can also be accessed by train, on the JR Nara line from Kyoto station (1 stop), or the Keihan line from Sanjo station (3 stops). 9:00am - 4:00pm (For November, opening hours are from 8:30am - 4:30pm). Tsuten-kyo & Kaisan-do: 400 yen (regular fee), Hojo Hasso Garden - 400 yen.